It all started thanks to a magazine, a day along the Charles, and an incredible crop of inspiring women. I’m standing by the side of the road, with my back to the Charles River on a Sunday spring morning. I’ve convinced my sister to walk from our apartment in Cambridge to go see the women’s Olympic Trials race. It’s the day before the Boston Marathon and I’m here because I want to run Boston someday. Maybe not next year, but some year. As soon as I can qualify. I have to work tomorrow so I can’t watch that race, but I assume this one will serve as some serious motivation. 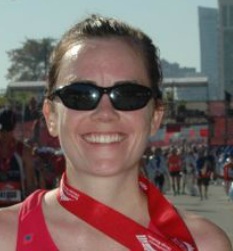 In the last month or so, I decided I wanted to get back into running, specifically into running marathons. It’s been three years since my first (as a college sophomore) and now that I’m living in Boston and have more time on my hands, I want to run another. I want to qualify for Boston. I have no idea how many marathons I’ll need to run to attain that goal, but I’m aiming to give it my first try that fall. But the issue also highlighted the Trials, which I had no idea were occurring that month in the same city I was living. It listed the women with the best chances of making the team—that was the first time I learned Deena Kastor’s name—and the up and comers. It included a course map, showing that they’d run up and down either side of the Charles, on loops that came within two miles of my house. I could see this race live! So here were are. We’re cheering for everyone, but most wildly for Deena. Thanks to my newfound knowledge, I know that she won a medal in 2004. 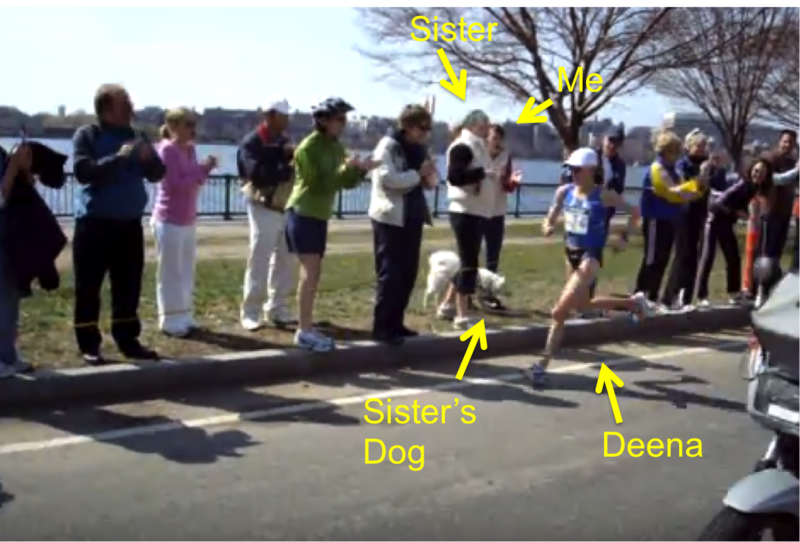 For most of the race she’s part of a pack chasing the woman2 who built a substantial lead. But as we cheer loudest for Deena, my sister wonders, “Wait a minute, maybe we should be cheering for the other woman to win. For someone new to have a moment to shine?” But truthfully, Deena’s name is one of the few I committed to memory. But I do also remember Joanie, who Runner’s World highlighted as the winner of the first women’s Olympic Marathon in 1984. 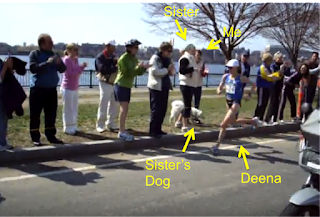 Now 50 years old, she’s aiming for sub-2:50 and everyone is cheering for her excitedly. Because it’s obvious, even to me, who doesn’t know much about elite running, that Joanie is someone to root for. It’s also obvious that sub-2:50 is incredibly fast. But standing there that day, I’m most blown away by the other women—the no names. After the profiles of the pros, Runner’s World included an article with stories of full-time architects, teachers, and restaurant managers. The article made them seem like normal women, who are mysteriously able to fit epic workouts in between work, family obligations, and everything else in their jam-packed lives3. But looking at them, they look like pros. Like crazy fast, exceptional athletes. (Because, duh, that’s what they are.) The are like 1004 of them, decked out in their bright sports bras and matching briefs, muscles perfectly toned, flying by like six-minute miles are effortless. They’re running in the wake of Deena Kastor for crying out loud. Where in the world do these women come from? How are they doing this? How are there so many that are this crazy fast? I can’t understand it. I’m in awe. At one point, my sister and I sprint along the side of the road to see how long we can make it with these speedsters. The answer turns out to be about 100 meters. One woman is forced to drop out near us. I see the tears and devastation as she’s comforted by a husband/coach/friend. It’s heart breaking; she must have dedicated so much time and effort to this race, but she doesn’t get to finish. I feel for her, and her grief sticks with me5. But of course, I can’t truly understand. These women are on another level. In my mind, they’re analogous to professional football or basketball players6. They don’t make any money from it, but they are clearly out of the range of normal. I know I don’t know much, but I know these women are doing something spectacular. I don’t for a second think I could ever be one of them. I can’t keep up for 100 meters. Yet I’m inspired nonetheless. I’m unsure I’ll ever make it to Boston. But I seriously hope I can. 2 It was Magdalena Lewy-Boulet, who led the race for 24 miles before finishing 2nd. The Runner’s World article didn't list her as a contender. 4 Google says it was 148. 5 For years, it turns out. 6 Fewer men and women make it to the Trials than play professional football. Awesome post! I live in So Cal and I'm planning to be at the trials next Saturday. I'll be cheering for you and all the other amazing women. Good luck! I hope you never have to wake up. I really enjoyed this. Thanks for giving me extra motivation for my mid-week long run.